Vetranio -- Roman emperor, AD 350. All six copper coin types. A guide for collectors. Vetranio was Augustus (emperor) in the Balkans from March 1, 350 until his abdication December 25, 350. Vetranio became emperor during the reign of the eastern co-emperor Constantius II in order to halt the eastward advance of the usurper Magnentius who had defeated and killed the western co-emperor Constans (brother of Constantius II) in Gaul at the beginning of 350 AD. Magnentius rapidly moved east and took Rome and Aquileia (at the top of the Adriatic sea). Constantius II was unable to personally respond because he was in the far eastern part of the empire. Vetranio, who was magister peditum in the Balkans, promoted himself to the rank of Augustus, declaring it was in support of Constantius II. Vetranio successfully held the Balkans until Constantius II was able to return and accept his abdication on Christmas Day, 350, after which he lived in retirement. For a longer biography (off site), see the on-line encyclopedia of Roman emperors, De Imperatoribus Romanis. The coins: Vetranio issued only six AE coin types; three are AE2's (c. 23 mm in diameter) and three are AE3's (c. 18 mm). All were new types, not carried over from existing types. Only two mints struck coins for Vetranio. The primary mint was Siscia (modern Sisak in central Croatia) and some coins were struck at Thessalonica (on the coast of Greece). Four of the six types were also struck for Constantius II and three for Constantius Gallus, which proves that some types initiated by Vetranio were continued after his reign, because Gallus did not become Caesar until 15 March 351, after Vetranio abdicated. All the coins minted in the name of Vetranio were minted by Vetranio. Vetranio also minted coins for Constantius II, but Constantius II did not return the favor. The following table is derived from RIC, Roman Imperial Coinage, VIII by John Kent, with rarity ratings modified by me in light of recent finds. Failmezger (Roman Bronze Coins from Paganism to Christianity, 294-364 AD) assigns one number per type and emperors are distinguished by a prefix: V = Vetranio, Cs = Constantius II, G = Constantius Gallus. This page lists and illustrates the six types of Vetranio issued in his name. 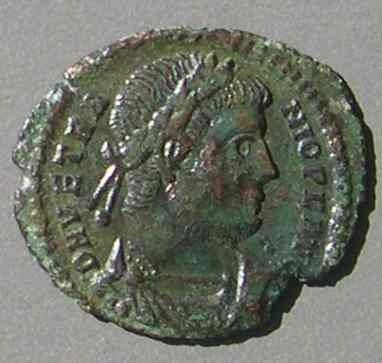 For images of these and additional coins in the names of Constantius II and Gallus see here. RIC numbers for this type. Failmezger number. Additional comments Coin image (Image sizes are proportional to coin sizes). RIC number of this particular coin. Its diameter, weight, and die axis. Emperor standing front, holding in each hand a standard with ch-rho. Vetranio, Constantius II, and Gallus. Common for Constantius II. Scarce for Vetranio and Gallus. Sirmium (all with "III" in left reverse field): Constantius II 21, 28. Gallus 22, 29. This type was issued simultaneously with the HOC SIGNO VICTOR ERIS type. c. 5.20 grams at Thessalonica. Second series only at Siscia: "A" behind and star in front of bust, 21-23 mm. Both series have "A" in the left field of the reverse. 23 mm. 4.56 grams. 12:00. 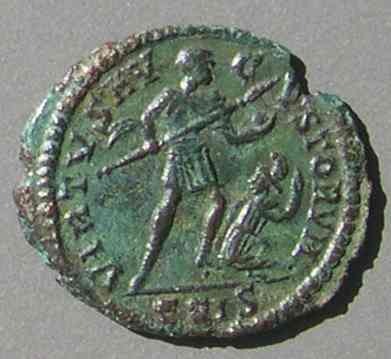 Vetranio (scarce) and Constantius II (scarce) at Siscia. at both Siscia and Sirmium. (Sirmium had not been minting during the reign of Vetranio). Cs 272-291, 304-311; V 275-292; G 306, 312. The series marks are as for CONCORDIA MILITVM above. Christian type. Nevertheless, it is readily available from the Siscia mint. 21 mm. 5.06 grams. 12:30. Only this one mint, this one issue. 23 mm. 4.71 grams. 12:00. 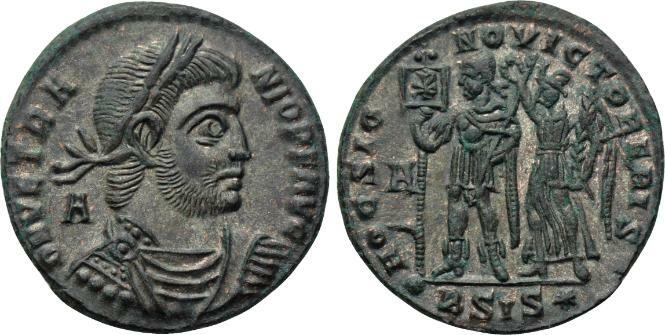 Emperor standing front, holding standard with chi-rho and reversed spear. Vetranio, Constantius II, and Gallus, all rare. Constantius II less so. Julian II as Caesar, very rare. 18-19 mm., c. 2.20 grams. Emperor standing right holding spear and globe, kicking captive. Vetranio and Constantius II, both rare. Failmezger 419 lists it for Gallus also. [This might be in error; it is not in RIC. "Third series." No obverse letters in the field. Vetranio has long been considered a "rare" emperor. However, in the 1990s many coins of the first two AE2 types were discovered. Because coins of Vetranio are much scarcer than those of other emperors of the period, they remain relatively expensive. 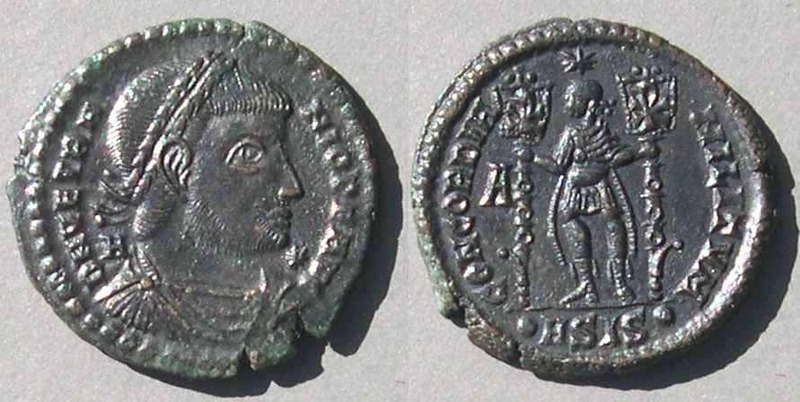 A search on vcoins.com will find many examples the first two types (some under Vetranio but often in the name of Constantius on the coin), but might not find the other four, which are much less available. For more: Go to a page with these images and additional images of these types in the names of Constantius II and Constantius Gallus. Return to the main page of this site, Ancient Greek and Roman coins.